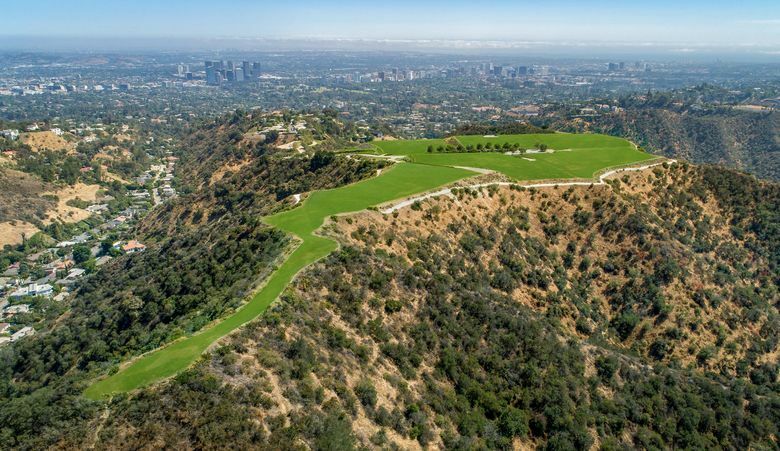 LOS ANGELES — On a summit above Beverly Hills, a sweeping 157-acre property touted as the city’s finest undeveloped parcel is hitting the market with L.A.’s first-ever 10-figure asking price: $1 billion. It’s being branded as “The Mountain,” and fittingly so. The undeveloped acreage sits at the highest point in the 90210 ZIP code, and it is — by a mile — the most expensive listing in the history of Los Angeles. For reference, a 120-acre plot owned by Microsoft co-founder Paul Allen is on the market in the same Beverly Hills Post Office area for $150 million. Last year, handbag tycoon Bruce Makowsky made waves when he listed his four-story mega-mansion in Bel-Air for $250 million. Aaron Kirman, the listing agent for the record property, calls it “the crown jewel of Beverly Hills,” noting that the potential is unparalleled. Views stretch from downtown Los Angeles to Catalina Island, and the closest neighbor is half a mile away. Disneyland, at roughly 85 acres, is a little more than half the size of the property. As one might expect of a mountain of a listing in Los Angeles, the property comes with a history tracing back to celebrities, moguls and even royals. “We’ll have a helipad, a couple of lakes and a Palladio-style house, like those you see outside Venice (Italy) but with a variation, because we’ll need lots of glass for the views,” Griffin told The Times in 1987. After falling into financial trouble, Griffin sold the mountaintop for more than $8 million in 1997 to Mark Hughes, the late founder of Herbalife, in deal that reportedly set a price record at that time for Southern California. Like Griffin and the princess, Hughes also had plans to develop the property for himself. However, he died in 2000 before any construction began. The current owner is Secured Capital Property, according to Ronald Richards, an attorney and spokesman for the company. Victor Franco Noval, son of philanthropist Victorino Noval, is listed as the manager of the LLC that owns Secured Capital Property. The elder Noval, who was sentenced to federal prison in 2003 after pleading guilty to fraud and tax evasion, is not associated with the property, according to Richards. The grounds are divided into 17 parcels. Six of them, ranging from 2.5 acres to 12.2 acres, are zoned for residential development. One imagines a developer curating a hyper-exclusive hilltop enclave filled with homes pushing past the $100 million mark, but Kirman believes it will go to an individual buyer. A royal family from the Middle East or a Chinese billionaire comes to his mind. He said he’s shown it to a few already; one envisioned a single-family compound, while one imagined cultivating a Huntington Garden-style oasis above the city. With an estimated marketing budget between $400,000 and $1,000,000 or more, Kirman plans to start jetting around the globe to shop it around. Paul Habibi, a UCLA real-estate professor, said the mammoth price tag is a reflection of the chasm of wealth inequality in the U.S. In his experience, luxury properties have the best chance of selling straight out of the chute. If the price isn’t right to start with, it will languish on the market. Murphy, whose company’s billionaire clients include Rams owner Stan Kroenke, said that he doesn’t foresee that any of them would be interested.